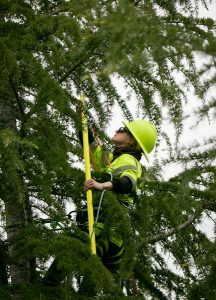 “Headache!” IBEW 1245 member Crystal Dimodica shouts from the top of a large pine tree, using the common utility safety phrase to indicate that something is falling from above. “Clear!” her co-worker down below hollers back to her, and moments later, a hefty branch comes tumbling down to the ground. Dimodica has been working as an IBEW 1245 line clearance tree trimmer for just over a year, first for Davey Tree, and now for Wright Tree. The petite 27-year-old woman may not look like your average tree trimmer, but anyone who’s seen her work can tell that she has clearly found her calling. 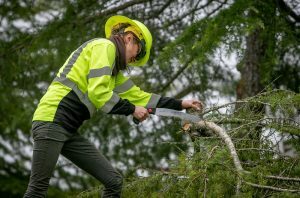 She maneuvers through the treetops with ease, meticulously taking down the branches that have grown too close to the power line suspended just a few feet over her head, and then works side by side with her co-workers on the ground to haul the debris into the chipper before moving on to the next job. 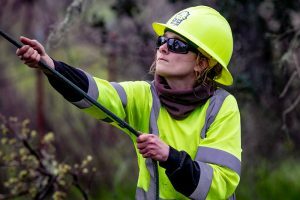 Her work ethic is unparalleled, and her commitment to excellence on the job has caught the attention of her supervisor, who referred to her as a “rising star.” But she isn’t just good at what she does – she also recognizes and values the critical role that her work plays in utility line maintenance and wildfire prevention. construction, at the dump, and in landscaping. 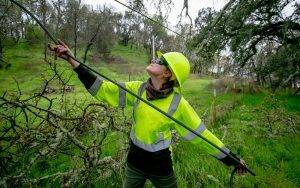 Through the California Conservation Corps, she also worked at Caltrans in an several warehouses. But she enjoys tree trimming the most because it presents her with a new and unique challenge each day. She particularly loves the fact that she gets to climb, especially since the only other women she’s come across in the field have been on the ground, doing traffic control and other types of work. Dimodica acknowledges that not a lot of women are cut out to be climbers, but in her eyes, the climbing aspect of the job gives her a chance to channel her inner superhero. While women in the tree trimming field clearly have unique challenges to contend with — including basic things like ensuring the gear and PPE fit correctly, and finding a place to use the bathroom when working out in remote areas — Dimodica wasn’t interested in talking about any of that. She wants to be viewed as ‘one of the guys’ and she works exceptionally hard to make sure that’s the case. “If they can handle it, I sure as hell can too,” she said. And while it can sometimes be tough for females to be accepted and treated equally in certain male-dominated work environments, thanks to the culture of inclusion and mutual respect at IBEW 1245, Dimodica says she hasn’t encountered anything sort of discrimination as a tree trimmer. So how do the other guys receive her when she comes onto the job? In true IBEW fashion, Dimodica views her crew as her brothers – and somewhat coincidentally, her own biological brother, Frank Dimodica, also happens to be a part of the crew she’s currently assigned to. The Dimodica siblings have been working together for several months at both Davey Tree and Wright Tree – Crystal started first, and Frank joined her about a month later. As a big brother, Frank’s natural inclination is to be protective of his younger sister, but he takes solace in the fact that she’s incredibly tough and more than capable of taking on the job and all that it entails. “I know she can handle herself — but I’m still going to keep an eye out,” he said. 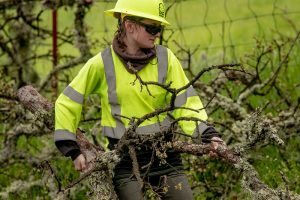 When the Utility Reporter caught up with the Dimodicas and their crew on a rainy April morning in rural Napa, it was a particularly tough time for the family, because their grandmother was gravely ill, and their mother and youngest sister were in Ohio to be with her in her final days. A brief flash of emotion came over her face as she talked about her family, but she quickly regained her composure as she explained how important it is to keep focused on the work. As a newcomer to IBEW 1245, Dimodica hasn’t had a whole lot of interaction with the union as of yet, but when Davey Tree lost its contract with PG&E in her area and she decided she didn’t want to commute into a different area, she took advantage of the provisions afforded to her under the collective bargaining agreement, and transferred over to Wright Tree. In her relatively brief time with the IBEW, she’s already come to recognize the value in having union representation.